Lake Texoma elevation is 613.33 which is 1 1/2 ft low and water tempter is 64 degrees. 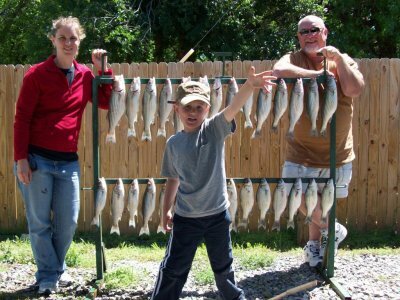 The striper fishing has picked up and the sand bass fishing has been excellent. Were finding allot steady action but the sizes have varied from day to day.The wind the past several weeks has really made it tough to get to the feeding stripers but when we can move around a little we seem to put a box of stripers and sand bass together. I think this year has a lot of us baffled. We have sand bass that should have spawned out a month ago still full of eggs and we have threadfin shad that shouldn't be spawning until next month spawning now.